Roman Catholic Womenpriests are honored to participate in the “Shadow Synod” which is being held in Rome in October 2008, at the same time as the Vatican Synod of Bishops on the Bible. Ree Hudson, a Roman Catholic womanpriest from St. Louis, is representing the Roman Catholic Womenpriests USA. Although a few women have been invited to participate as experts, decision-making at this Synod will once again be limited to male clerics. “In contrast, Roman Catholic Womenpriests are offering the church a renewed model of priestly ministry, rooted in the New Testament,” Bridget Mary Meehan, media spokesperson, said. “Jesus, who treated women and men as equals and partners, offered an example of Gospel equality that led to the practice of ordaining women as deacons, priests and bishops in the early church. The good news is now there are Roman Catholic Womenpriests serving the Roman Catholic Church in grassroots communities in the U.S., Canada and Europe.” Jesus chose the Samaritan woman to announce the good news to her entire village, and the Samaritans accepted Jesus as Messiah because of her testimony. Mary of Magdala, the first witness to the resurrection, was commissioned by Jesus to be the apostle to the apostles (John 20:1-18). The Pontifical Biblical Commission echoed the sentiments of Jesus in concluding there is no biblical reason to prohibit women’s ordination. Women and men are created in God’s image, and both may represent God as priests. “In the image of God, God created humankind, male and female, God created them” (Genesis 1:26-27). Following a two-year study of scripture, the Pontifical Biblical Commission, in 1976, agreed by a vote of 12-5 that neither the Bible nor Christ excluded the ordination of women. The vote in favor of women’s ordination was 14-3. Although the Roman Catholic leadership has been all male for the past 900 years, Christianity’s first millennium saw numerous women serving with distinction as deacons, priests and bishops. Roman Catholic Womenpriests are reclaiming our ancient heritage and shaping a more inclusive Christ-centered church of equals in the twenty-first century. Womenbishops, ordained in full apostolic succession, continue to carry on the work of ordaining others in the Roman Catholic Church. We are living a new model of priestly ministry united with the people with whom we serve. Ordained women are serving the people of God in many ways, including house churches and parish communities, celebrations of weddings and baptisms, hospital and hospice chaplaincy, prison ministry, anointing of the sick and elderly, ministering with homeless people, peace and justice witness, and spiritual direction. Our movement is receiving enthusiastic responses on the local, national and international level. Following Maryknoll Father Roy Bourgeois’ participation in the ordination of a Roman Catholic womanpriest in Lexington, Kentucky, on August 9, 2008, the Maryknoll Community has called for a worldwide dialogue on the issue of justice for women in the church, including the ordination of women as priests. Roman Catholic Womenpriests stand in solidarity with our biblical sisters who reflect the feminine face of God. Womenpriests remind us that women are equal images of the holy. Twenty-five women share their stories of call to priestly ministry in our new book, Women Find a Way: The Movement and Stories of Roman Catholic Womenpriests. The call for full equality of women in the church is the voice of God in our time. Roman Catholic Womenpriests will join the Women’s Ordination Conference (WOC) and Women’s Ordination Worldwide (WOW), the international coalition that advocates women’s ordination, beginning on the feast day of Saint Teresa of Avila, October 15, in Rome. There will be a press conference that day, followed by four days of actions and events. 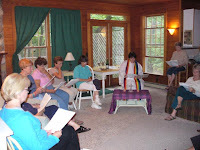 Oct. 19: Evening Feminist Liturgy and educational social event with other church reform groups. Women's Ministry: a reality in the early Church – indispensable in today's Church! 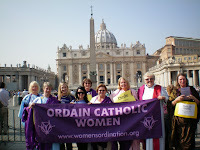 ROME, Italy – Today, at 11:00 o’clock in the office of redazione di ADISTA, Via Acciaioli 7, 00186 Roma, representatives of Catholic organizations from around the world call for the full and equal participation of women in the Roman Catholic Church, including ordination as deacons, priests and bishops. The press conference takes place on the feast of St. Teresa of Avila, one of only three female Doctors of the Church, and will launch a weeklong campaign of events, including a demonstration at Saint Peter’s Square immediately following. These events occur as 240 delegates continue the Synod of Bishops on the “Word of God in the Life and Mission of the Church.” Representatives from Britain, Germany, Japan, the Netherlands, Portugal and the United States are participating in the campaign events. The Pontifical Biblical Commission determined in 1976 that there is no scriptural reason to prohibit the ordination of women. The Bible describes how women were prominent leaders in Jesus’ ministry and early Christianity. In all four gospels, Mary Magdalene was the primary witness to the central event of Christianity—Christ’s resurrection. The Scriptures also mention women who led small house churches, including Lydia, Phoebe, Priscilla, and Prisca. "It is our hope that the synod delegates heed the call of Catholic theologians and Scripture itself, which proclaims women are equally created in the image of God (Gen. 1:27), and that there is no distinction between men and women through Jesus (Gal 3:28)," Taylor concluded. After the press conference and demonstration at 17:00 hours Catholic women’s ordination activists gather outside the church S. Maria in Transpontina (Via della Conciliazione) for a public prayer service. Immediately afterward, the representatives will deliver a petition, signed by 1,571 Catholic organizations and individuals, urging Pope Benedict XVI to reinstate women in the diaconate. The “Purple Stole” Movement (“Lila Stola”) intercedes for equal access of women to all church functions, for an equal mentioning of women and men in church publications, for a female image of God and a female liturgy. Roman Catholic Womenpriests (RCWP) is an international initiative within the Roman Catholic Church that advocates for a new model of priestly ministry united with the people with whom they serve. The movement is an initiative within the Church that began with the ordination of seven women on the Danube River in 2002. Women bishops ordained in full apostolic succession continue to carry on the work of ordaining others in the Roman Catholic Church. Founded in 1975 and based in Washington, D.C., the Women's Ordination Conference is the oldest and largest national organization working solely for the ordination of women as priests, deacons, and bishops into an inclusive Catholic Church. WOC also promotes new perspectives on ordination that call for more accountability and less separation between the clergy and laity. Founded in 1996, the Women's Ordination Worldwide is an ecumenical network, whose primary mission at this time is the admission of Roman Catholic women to all ordained ministries. Member groups represent thirteen countries and reach many others through international groups. 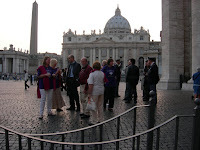 Italian and Vatican Police Confront Women Outside St. Peter's in Rome Congratulations to the Worldwide Coalition, Speaking Truth to Power for Justice for Women in the Roman Catholic Church! ROME, Italy - Yesterday, at 6:00 o'clock, the Italian police stopped representatives of Catholic organizations from around the world as they walked into St. Peter's Square to deliver a petition calling for the restoration of women's ordination to the diaconate. 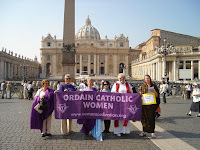 The group was holding a banner saying "Ordain Catholic Women" and handing out educational materials. 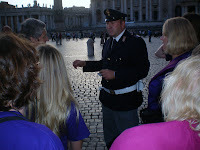 A total of thirteen members of the Italian and Vatican police gathered to question the eleven representatives. After taking their materials, the Italian police demanded their passports and called the Vatican police, who sent their chief. According to a member of the Italian police, this was the first time in 15 years the chief came to question demonstrators. He did not allow them to deliver the petition to the Portone di Bronzo but said he would deliver it to the pope himself. Earlier in the day, the group brought the same banner and materials into the Square without getting stopped by the police. The representatives are in Rome during the Synod of Bishops on the Bible, calling for the full and equal participation of women in the Roman Catholic Church, including ordination as deacons, priests and bishops. "Our peaceful action did not merit the extreme reaction of the police-sending the chief down to interrogate us while seizing our passports," stated Aisha Taylor, executive director of the Women's Ordination Conference. "However, I was not surprised. Time and again, when it comes to women's role in the Church, the Vatican overreacts and demonstrates just how fearful they are about the growing support for women's ordination. " The Pontifical Biblical Commission determined in 1976 that there is no scriptural reason to prohibit the ordination of women. The Bible describes how women were prominent leaders in Jesus' ministry and early Christianity. In all four gospels, Mary Magdalene was the primary witness to the central event of Christianity-Christ's resurrection. The Scriptures also mention women who led small house churches, including Lydia, Phoebe, Priscilla, and Prisca. The representatives are from Britain, Germany, Japan, the Netherlands, Portugal and the United States. They represent the millions of Catholics from around the world who support women's ordination. By ALESSANDRA RIZZO Associated Press Writer ROME (AP) - "Catholic women seeking to become priests denounced the church's ban on female ordination as sexist and unjust, bringing their campaign close to the Vatican on Wednesday during a worldwide gathering of bishops." "...In March, the archbishop of St. Louis excommunicated three women _ two Americans and a South African _ for participating in a woman's ordination. They were part of the Roman Catholic Womenpriests movement, which began in 2002." Commentary: It is time for the Roman Catholic Church to cross the Tiber and affirm womenpriests Several hours ago, I received a call from an Associated Press Reporter in the United States in response to this article which is now both on mainstream print, tv and internet sites. All it takes is a few courageous people to change the world!! (evidence of the Spirit's movement in the church) Roman Catholic Womenpriests are building a bridge across the chasm of patriarchy to help God's people cross over from the hierarchial model of church to an open, participatory, Christ-centered, Spirit-empowered, partnership community of equals-- a model of church that resembles the Gospel equality of Jesus and the early church community tradition. As the women advocates of a renewed priestly ministry crossed the Tiber, so Roman Catholics around the world cross a new threshold from sexism rooted in discrimination to equality and justice for women in the church. It is about time that women take the rightful place as partners and equals in our beloved church. In the reports from Vatican Synod on the Word of God, I have not heard much about the example of women as leaders in early church. Have the church fathers or the few women experts even raised the topic of the role of women like Mary of Magdala, the apostle to the apostles or deacon Phoebe, or the apostle Junia as examples for all Christians including Roman Catholics of prophetic, visionary, holy women disciples? How about the women who presided at the house church eucharists? Women, like Mary Ellen Robinson, and (many other Roman Catholic Womenpriests) are following Jesus example of partnershp and community building. We have come full circle back to house churches. I think Jesus would feel right at home in our welcoming, inclusive communities. ROME (AP) - "Catholic women seeking to become priests denounced the church's ban on female ordination as sexist and unjust, bringing their campaign close to the Vatican on Wednesday during a worldwide gathering of bishops." "...In March, the archbishop of St. Louis excommunicated three women _ two Americans and a South African _ for participating in a woman's ordination. They were part of the Roman Catholic Womenpriests movement, which began in 2002." Roman Catholic Womenpriests are building a bridge across the chasm of patriarchy to help God's people cross over from the hierarchial model of church to an open, participatory, Christ-centered, Spirit-empowered, partnership community of equals-- a model of church that resembles the Gospel equality of Jesus and the early church community tradition. As the women advocates of a renewed priestly ministry crossed the Tiber, so Roman Catholics around the world cross a new threshold from sexism rooted in discrimination to equality and justice for women in the church. It is about time that women take the rightful place as partners and equals in our beloved church. In the reports from Vatican Synod on the Word of God, I have not heard much about the example of women as leaders in early church. Have the church fathers or the few women experts even raised the topic of the role of women like Mary of Magdala, the apostle to the apostles or deacon Phoebe, or the apostle Junia as examples for all Christians including Roman Catholics of prophetic, visionary, holy women disciples? How about the women who presided at the house church eucharists? Women, like Mary Ellen Robinson, and (many other Roman Catholic Womenpriests) are following Jesus example of partnershp and community building. We have come full circle back to house churches. I think Jesus would feel right at home in our welcoming, inclusive communities. gospel. "She cites that the Gospels and Pauline letters are vivid " handbooks for community" and that in the Pauline understanding "God's Trinitarian communion unfolds in communiites that live in God for the sake of others." "The meaning of prophecy is the protest against the self-righteousness of the institutions. God thoughout history, has not been on the side of the institutions but on the side of the suffering and the persecuted." Now is the time for Pope Benedict to apply this grace-filled insight to the Roman Catholic Church he now leads. As a Roman Catholic Womanpriest, who serves the marginalized in the church, I raise the issue of the second class citizenship of women in the contemporary church. The institutional church is on the wrong side of history again. The movement toward the full equality of women in church and society is the voice of God in our time. The institutional church needs to abandon laws that discriminate and/or increase women's sufferings and repent of its self-righteousness, and embrace all whom it persecutes as God's beloved ones. May the light of the Holy Spirit dawn once again, on Pope Benedict in a New Pentecost of prophetic action and community building.